The originally configured transrotor turntable – leonardo 40/25 was supplied with a slow speed synchronous turntable motor drive, which exhibited sufficient speed fluctuation to produce significant pitch changes on sustained notes from brass or woodwind instruments. I measured the frequency variation using the Cardas test LP and a 6 digit electronic counter attached to the loudspeaker terminals. By taking a series of 1 second gated measurements on the 10 KHz frequency tack it was established that the speed variation in the signal was +/-0.25%. Since this was an unacceptably high so a solution to the problem was sought. The original equipment supplier suggested a higher-grade (expensive) transformer would solve the problem. Being unhappy with this suggestion and having seen some adverts for Origin Live DC drives. I contacted Audio Revelation who quickly arranged to have a trial turntable motor and drive delivered. Unfortunately due to the pulley ratios on the Transrotor deck the speed range of the standard control was insufficient to obtain the correct speed. This, however, was quickly rectified by the supplier and new modified unit supplied. After a few hours of break in, the speed was set up by using a small screwdriver to adjust the potentiometer on the circuit board and a suitable record played. The sound was considerably cleaner, the definition and resolution were notably improved and of course the pitch variation problem had disappeared. On using the test record and frequency counter as before the frequency variation was now found to be less than 0.07%. Thanks to Origin Live and Jay at Audio Revelation the problem was solved and the OL drive is now a permanent part of my system. 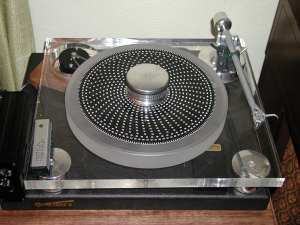 The photograph below shows my Transrotor deck with the Origin Live turntable motor.